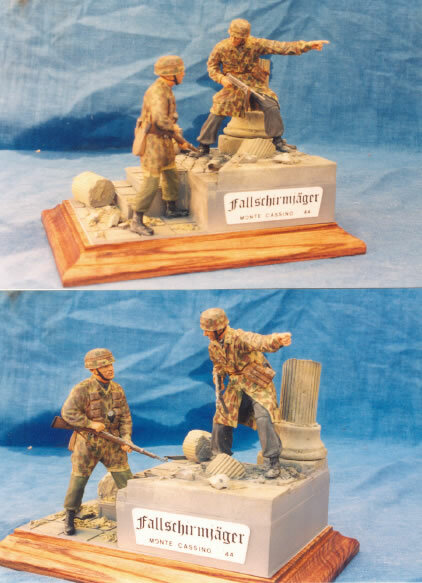 I had bought a Dragon figure of a german paratrooper and was going to make it as a straight out of the box model on its plastic base, then a friend gave me a Kirin resin kit of another para this time in a better pose and with a part detailed resin base. I extended the bottom of the base and added it to a wooden one and made an extra stone column from a cake decoration part and assembled the two figures together, the Kirin one was just at the right height to appear to be looking at the Dragon one. The base was painted in light sand and gradually darkened with browns and greys.